The problem from my perspective is the market is speaking with their dollars and saying the Wrangler is what they want. Toyota still offers the 4Runner, but it's a tiny niche in terms of sales and really even then isn't after the same buyer as the Wrangler. Ford has a huge opportunity with the Bronco, sticking that name on an Everest is just half assing it's potential. IMO one of the best features of the Bronco was the removable roof. Obviously you can't do it like they did in the 60s to 90s since you would need a roll cage for obvious reasons but if it won't have it, that's a bummer. Last edited by Andrew L; 01-11-2017 at 01:04 PM. I have reason to accept it's a new platform-generation. -but that answers any doubts about the lifespan of current RotW versions imho. if they want something to compete with the 4Runner, the Everest is a nice idea but a "Bronco" can´t be just an Everest. Slapping the Bronco name on an Everest would be a failure and a waste of time, in my opinion. I'd be greatly disappointed if that's the route they take. Wow, you guys have already condemned the vehicles as failure practically. Based on what? A few remarks and opinions on the internet. If the guy was a Ford employee, what he did was wrong and hopefully he is held accountable. I put a lot of effort into not divulging sensitive secrets, especially product so far out. I won't touch this one any further. I don't believe that guy was correct anyway. I still think we'll see something completely unique from the Everest, but still based on Ranger's platform. My point is simply that Ford's crossover lineup is already filled with vehicles like the Everest in Edge and Explorer (with Escape and Expy below and above those, respectively). Why do they need another one slotted in there that is essentially the same vehicle? I just think a vehicle that targets a different audience (like the Wrangler) would be far more successful than another regular SUV in the lineup in the form of a rebadged Everest renamed Bronco. SP1966 and iculookn like this. I'm simply responding to what was in that Reddit post, I acknowledge that it may be complete BS. That said the Bronco could well be a sales success for Ford while failing to fill a currently unfilled niche in their lineup. That wouldn't be a failure, but it would be extremely disappointing to me as a Ford fan. Well, in 2004 this is what Ford anticipated the Bronco to look like. From my perspective, it looks like the Troller T4 that came later offered production design elements of that concept, in a smaller package. Remembering that the large Bronco concept above was when GM sold Hummer. Those days are over. With global fuel economy restrictions getting tighter, a next gen Troller-ish Bronco on Ranger platform makes sense. Also, with Ford's consistency with offering 4-door vehicles to reach a wider market. 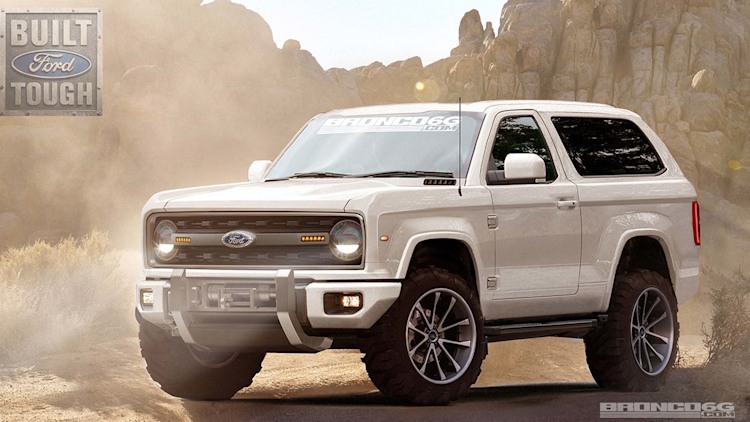 It's highly doubtful that a somewhat impractical 3 door Bronco will be the plan. Ford needs a piece of the large and growing global Jeep consumer base. Wrangler sold 191.774 units in the US for 2016 by the way. Which is why I think a Troller T4 inspired, 4 door Bronco, lightweight, Everest size SUV with removable doors option and canvas roof option works. I think that if Ford produces it with styling cues from at least one era, gives it aggressive offroad looks and capability (big tires, good ground clearance, big suspension travel, advanced AWD, skidplates, etc.) a powerful engine, and the name Bronco.....that the product will be well received by many. Especially because Ford does not make another SUV anywhere close to this. Certainly not the Explorer. The only thing missing for me personally, would be a removable section of roof. Perhaps Ford will surprise us there. As far as door count, I am on the fence. Climbing into the back seat of a tall 2 door 4x4, requires either youth or great skill and flexibility or all of the above. I had one. I know. Ford is smarter than that, no matter how cool we may think it to be. And no, deployable running boards have no place on a Bronco.